There’s a lot going on in our community. We are growing like never before. 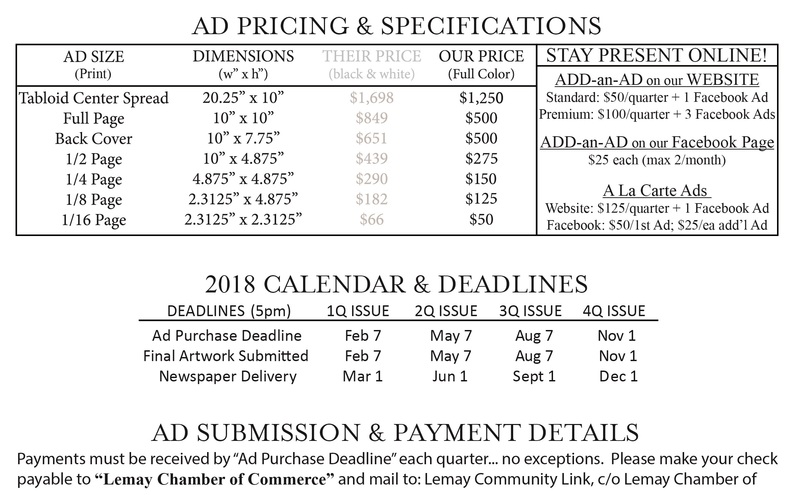 Community Link is published by non-profit organizations in Lemay: the Lemay Chamber of Commerce, Lemay Development Corporation, and Lemay Housing Partnership, with the help of Hancock Place School District and RISE! We are working together to distribute community updates, neighborhood news, and local events. We look forward to working with you to provide this essential service to every resident and business in 63125. With additional stacks in local grocery stores, banks, and other high-traffic locations, that’s over 15,500 impressions each quarter.